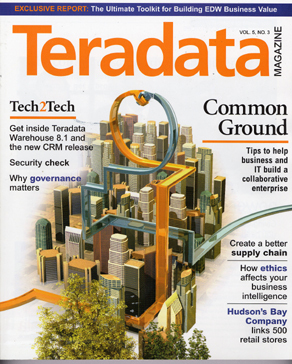 Teradata is a quarterly magazine read by current and prospective users of Teradata enterprise analytic technologies, as well as senior business executives, IT professionals and industry experts. The magazine has nearly 50,000 readers, up to 30% of which are international. A division of NCR, Teradata’s solutions provide companies with a single, integrated view of their businesses so they can make better, faster decisions that drive growth and profitability. Over the course of 25 years, Teradata has emerged as a worldwide leader in enterprise data warehousing, with a roster of more than 800 customers worldwide.